This is one of the shots from my failed attempt at doing a 365 series titled ‘Where is Garfield Now?’ or WIGN for short. The basic premise was to shoot a Garfield Pez dispenser in different places/scenarios for 365 days. 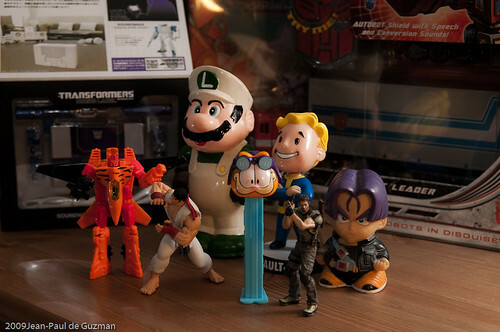 It was totally random, and it all started when I picked up a Garfield Pez dispenser at a garage sale. I did over 150 odd some days. I do have about a dozen unposted shots, but after falling behind in posting it, I ended up scrapping the whole thing. I’ve been meaning to do it again since, but just haven’t found the main subject as appealing as Garfield. “Garfield decided just to stay at home today, and chill w/ some buddies. He also told Optimus and Soundwave that the new movie didnt wiggle his tail, unlike the first one.